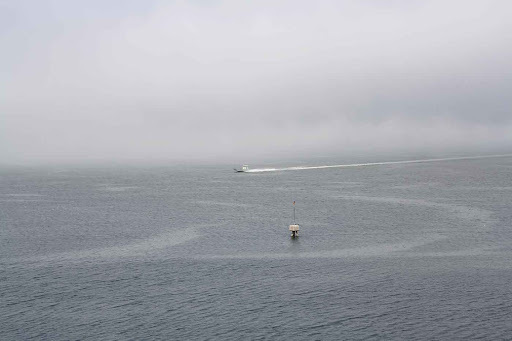 The boat was racing through Halifax Harbour on a foggy morning. See more at Water Wednesday. Could it be racing the fog as well as in the fog? The ultimate boating challenge! I like the patterns in the water! Cool capture, it does look like it going fast. Very nice! I really like the way you framed the shot. Ohhhhhhhhhhhh, how I love fog on the sea!! Nothing more quiet and yet disquieting at the same time. Have a super duper day!!! From the looks of this shot, the boat really was in a big hurry racing through all of that fog. Guess he knew where he was going. The swirls in the water are so pretty...if I remember correctly the different coloration means that is a cold or a warm spot in the current.Beautiful shot. I hope this boat has radar and sonar and doesn't hit another boat going the same speed, Andy. Nevertheless, it is a neat photo. I've driven in fog on land, and have been a boat in a fog, but not at the helm. Is It Bulrush Or Cattail?